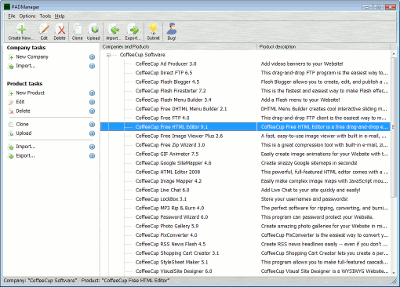 PADManager is an advanced PAD (Portable Application Description) editing and managing application. Portable Application Description or PAD is a standard developed by the Association of Shareware Professionals (ASP). It is designed to replace the old non-formal file_id.diz and other textual program descriptions with an XML-based and strictly specified format. PADManager is an advanced PAD (Portable Application Description) editing and managing application. Portable Application Description or PAD is a standard developed by the Association of Shareware Professionals (ASP). It is designed to replace the old non-formal file_id.diz and other textual program descriptions with an XML-based and strictly specified format. PADManager fully complies with the PAD specification. It produces correctly formatted 100% compatible PAD XML files. In addition, PADManager allows you to manage the data that you put into your PAD files. You can create as many company and product profiles as you need and easily switch between them. PADManager has a built-in FTP uploader. It remembers the FTP path and allows you to upload your XML files with a single mouse click. The program automatically checks for available updates. With PADManager, you are always sure that you are using an up-to-date version of the PAD specification and the most recent versions of the PAD extensions. PADManager automatically downloads and installs them for you. PADManager supports the DynamicPAD technology. This technology allows you provide customized PAD files for each software archive and to gather accurate statistics of downloads generated by them. PAD is an essential part of the software submission process. PADManager will help you maximize the results of your submissions to download sites. More listings, better visibility, higher positions in search engines result pages.